Chief Minister Pema Khandu today flagged-off the 5th leg of Rally of Arunachal here at Civil Secretariat campus.The Chief Minister expressed his happiness on the event being organised in a grand manner and organised way. 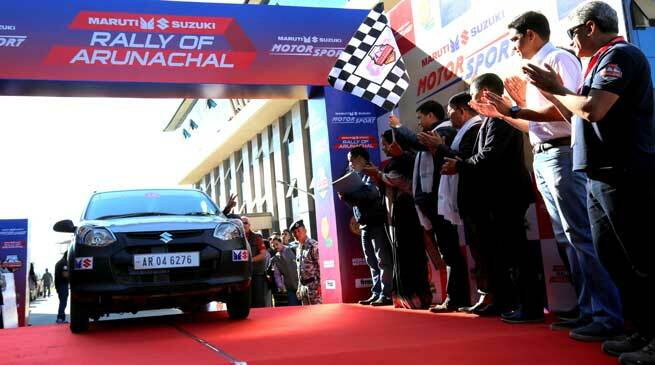 He thanked Lhakpa Tsering, a motorsport enthusiast and son of former Minister Tsering Gyurme for organising the Arunachal Rally of the Maruti Suzuki National Super League, and for bringing Arunachal’s adventure potential to the country. The “Rally of Arunachal” will cover approximately 700 kms, crossing Itanagar, Pasighat and reach Dambuk, where the rallyists will be able to witness the Orange Festival of Adventure and Music. The Chief Minister said that he is looking forward to meet again all the rallyists at Dambuk, where he will join the Orange festival on December 17. “Arunachal is a beautiful place. We have lot many places especially for adventure. Please do have such kinds of events more in future. Definitely government will support such endeavour,” he said. Lhakpa, who heads the Motorsports Club of Arunachal, has been organizing such rallies with the aim of showcasing Arunachal, as a prime adventure sports destination. He said this is the first time Maruti Suzuki motorsports has opened a new frontier in Arunachal. The championship is a combination of six different rallies namely Uttarakhand Rally, Deccan Rally, Backwaters Rally, Mughal Rally, Rally of Arunachal, Rally of Gujrat and offers a chance to more and more amateur rallysts to participate in motor rallies. The Rally follows Time-Speed-Distance (TSD) format that tests the skills of driver, and retains the adventure of competitive motorsport, thus making more and more amateur drivers to participate in the motorsport activity, Lhakpa informed. The flag-off ceremony was participated by Advisor to Chief Minister Kameng Dolo, Education Parliamentary Secretary Bamang Felix, Sports & Youth Affairs Parliamentary Secretary Nyamar Karbak, Chief Secretary Shakuntala Gamlin and Commissioner Finance Ashis Kundra.